Immigrants at the southern United States border are facing unprecedented obstacles and are being separated from their children. 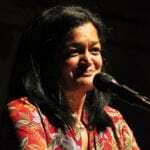 On July 20, 2018, Jayapal co-led a group of eight U.S. Congress members to the U.S. border in Texas, where they watched a mass criminal prosecution of immigrants in a federal court and witnessed immigrant parents being reunited with their children. Jayapal shares what she saw in Texas with KBCS’s Yuko Kodama.